The snowpack at Mores Creek Summit is providing great riding conditions for skiers, boarders, and bilers. The snowpack above 6500 at most W, NW, N, NE, and E aspects exceeds 2 meters in depth. Densities for the top meter have jumped for the top half meter from an average of 17% to 23% in less than a week due temperatures near the freezing level and copious amounts of snow that have favored settlement (densification of snowpack by reduction of air porosity due to the effect of gravity). 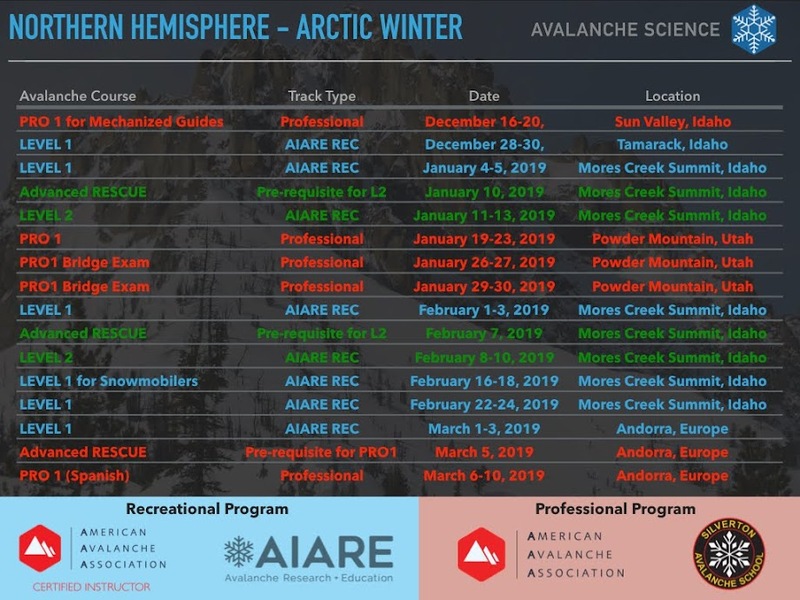 The current snowpack as well as the higher moisture content snow forecasted for this week will provide a solid base for the early March storms, that will finally OPEN most of the skiing terrain at MCS. Yipee!!!!!!! Last Friday I spent time ski touring Tamarack's backcountry bowls and doing some research with my "toy radar". The snow was superb! Tamarack average elevation for ski touring terrain is lower than Mores Creek Summit, but the recent snow have definitely opened lots of terrain. A lot of the upper bowls get the attention to most. However, there are LOVELY glades and wonderful old forest skiing for those looking for higher quality snow. Remember open slopes are usually victims to wind! A week ago I was puzzled by a very dirty layer at Mores Creek Summit. I incorrectly assumed it was dirt from trees. But that same layer was also present at Tamarack. Check the picture shared below with a VERY well defined dirty layer. Our snow pit work focused in snow science stuff; Radar characterized stratigraphy, Near Infrared stratigraphy, blah, blah, ..., but we looked at stability. No evidence of instability was found, with only easy compression failures with resistant planar (Q2) at a fracture plane 20 cm below the snow surface. Fracture propagation tests were unremarkable at the location we tested. It is important to EMPHASIZE the nature of the snowpack in our region. We did not find evidence of instability, but we need to be aware of the unprecedented variability of the snowpack at all depths. Throughout our region there are deeply buried PERSISTENT WEAK LAYERS that have consistently shown propensity to propagation! Our thoughts NEED not to be about trigger likelihoods but CONSEQUENCES! It is important to comprehend that deep persistent weak layer avalanches are likely to be unsurvivable, and that significant trauma is a likely component besides deep burial. Furthermore, the highly variable storm temperatures, wind and precipitation rates have resulted in a mosaic of layers buried at the top meter. At Tamarack we identified multiple thick graupel weak layers, and at Mores Creek Summit advanced facets under a crust. These weak layers are in the top 40 cm of the snowpack. There are also reports of random spots of surface hoar, and near surface facets! In summary, there is a LOT of variability ... Be very suspicious of the snowpack, and moderate slope angle selection. Sunday we covered lots of ground as we skied the South East glades of Freeman into the Twelve Mile Creek. From Twelve mile creek, we skinned up to Rando's Ridge. We covered an excess of 10 kilometers where we did not observe signs of avalanche activity during the last 3-4 days. As mentioned earlier in the post, at MCS there is a concerning weak layer consisting of facets under a fragile crust. These weak layer is buried at 25-30 cm of new snow. That layer was present at elevations below 7000 feet. These layer will require attention as snow precipitation events resume later this week. As you can see in the next picture, skiing even at slopes with South aspect had a high level of entertainment value. The skiing at North and Northeast aspects was exhilarating, with even softer and deeper pow. We selected Sonyas, a north aspect and well protected slope, as the exit ski run. The pow conditions were delightful! Last Sunday we had great turns at MCS, but the best part was to watch HOW many folks enjoyed Idaho City recreation resources as well. It was fun to rendezvous with Andreas and Hanna's pod and learnt that they had a great time over Freeman West Glades, and watch Tompton's party hike back to the pass after skiing Pilot's Summit Creek area. I also ran into other Boise State Unversity snow scientists doing research work next to MCS Snotel. And it was super cool to interact with snowmobilers combining snowboarding with snowmobiling ... very cool indeed!